As we sat outside the bivi hut cooking dinner in the last of the evening sun, Sam got chatting to one of the Swiss climbers who also had their eye on the west ridge. Predictably the conversation soon turned to how long we hoped to climb the ridge in. With 32 pitches of climbing, mostly in the 5s and 6s, the 1,000m long West Ridge of the Salbitschijen would be the biggest and most sustained rock climb I’d ever attempted. Guidebook time for the route is 12 to 16 hours for a competent party that doesn’t run into trouble. I like to think that Sam and I are reasonably competent, but a route of this length gives a lot of time for trouble to develop. Add to the mix that we only had 14 hours of daylight to work with and the odds of becoming benighted didn’t seem so small…. 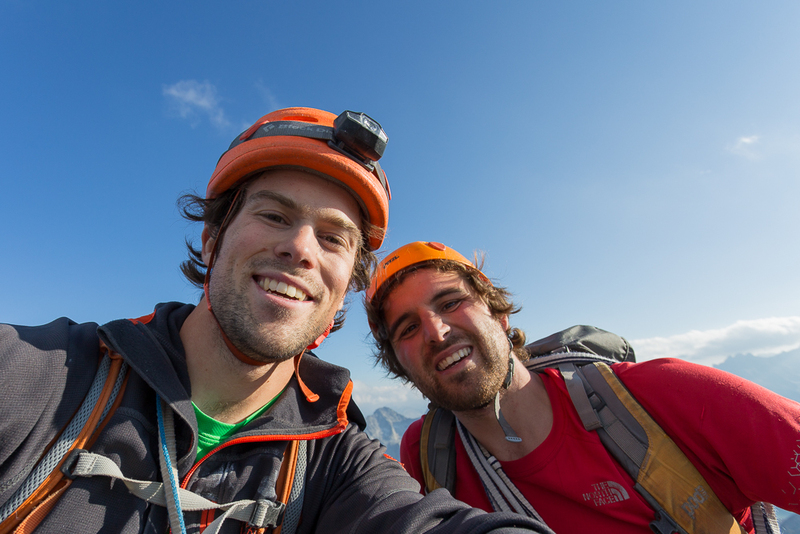 “I think about 10 to 12 hours,” Sam confidently told the Swiss climber…. Feeling a little less confident, I thought of the big down jacket and foil blanket I’d put in my bag. The next morning we were up bright and early, opting to climb the first couple of pitches under headtorch. A physical 6b layback was our warm-up for the day. Needless to say, I was happy to let Sam take the lead. The pitch looked great and just 10 metres up Sam was already raving about the quality of the climbing, a theme that would continue for the rest of the day. Aware that time was not on our side, we were focussed on being quick and efficient, and though we pitched everything on the route we didn’t hesitate to run things out on easier ground or simply do a pitch belay-to-belay without gear (please don’t fall Sam!). This focussed approach to getting up the route paid off and we were soon quickly making our way through the five towers that make up the ridge. The quality of the rock and the climbing was excellent from the start and just got better with each tower (we didn’t encounter a single loose hold on the entire route!). The climbing was also pretty varied, although laybacking is definitely the theme of the day. Before we knew it we were at the top of the fifth tower, somehow avoiding any major hiccups. A short rappel brought us to the base of the summit pitches and with five hours until sunset it looked like we were going to make it. These last few pitches brought a few awkward surprises and route finding confusion, but this didn’t cost us too much time and 12 hours after starting we were at the base of the summit pinnacle. A series of easy but unprotectable layback moves led to the summit itself. Sitting on the summit, we were both elated to have climbed such an incredible route and to be able to finally take off our climbing shoes! 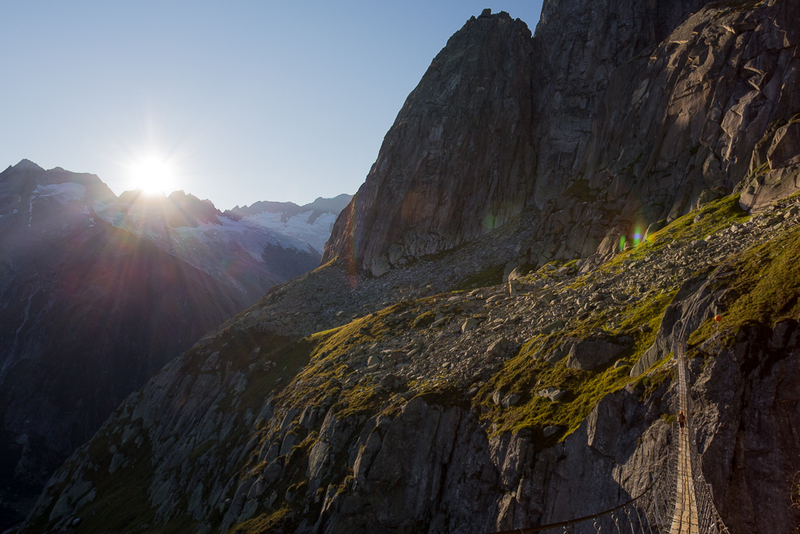 With only a couple hours until sunset we quickly packed away our gear and started the descent. This passed easily though after so much climbing it felt far longer than it was. Arriving back at the van shortly before midnight I slumped in the passenger seat, grateful that I wasn’t the one driving us back to Chamonix (thanks Sam!). As we rolled back into town I looked forward to a long lie-in and doing absolutely nothing the next day. Sam, on the other hand, would be up just a few hours later for his first transfer of the day. Ouch! Sam on the walk-in to the bivouac hut which is situated just 5 minutes from the start of the ridge. The big lump of rock in the middle of the photo is the first tower. There are 5 of these and then the summit tower itself! 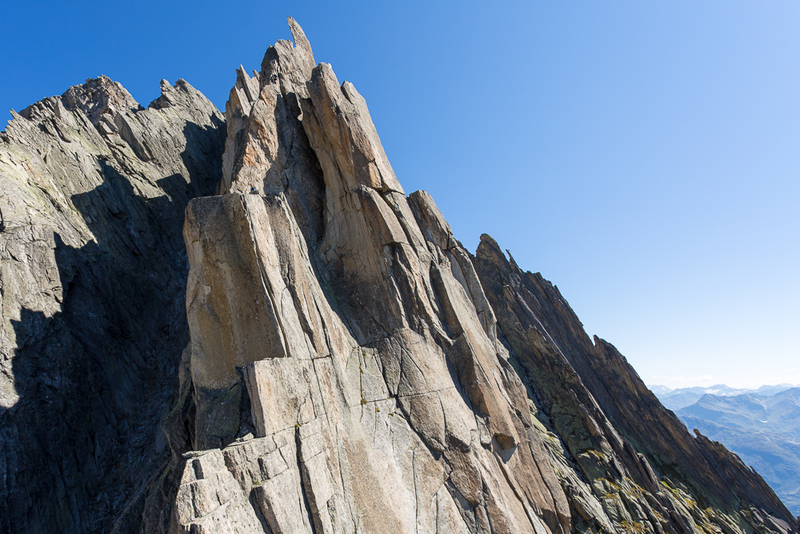 As you have to untie from the ropes and rappel after climbing each of these towers, the route takes notably longer to climb than it would if it was simply a 1,000m face. On the plus side though, these rappels whilst climbing the ridge make the descent from the summit far quicker! 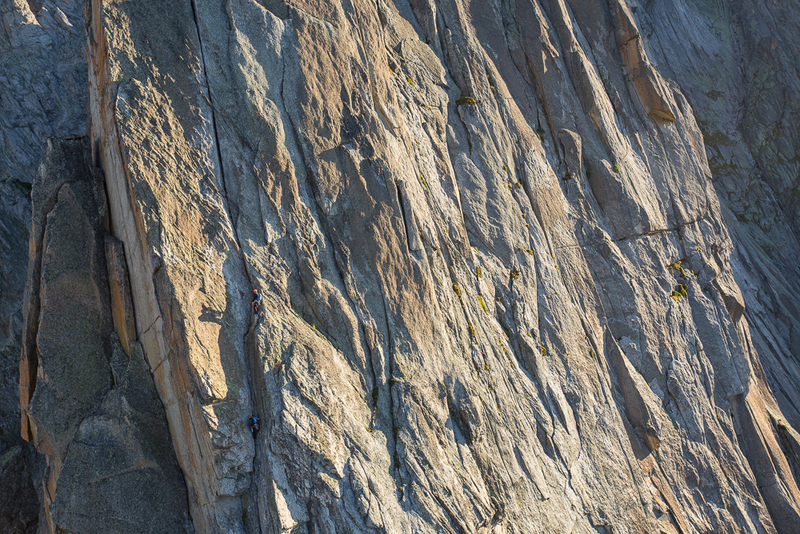 A team of climbers make their way up the second tower. Here the second climber is about to finish an amazing 50m layback pitch. Next up is the crack above them, an equally good 50m offwidth. More splitter granite on the fourth tower. If you look closely you can just make out the team ahead nearing the tower’s summit. 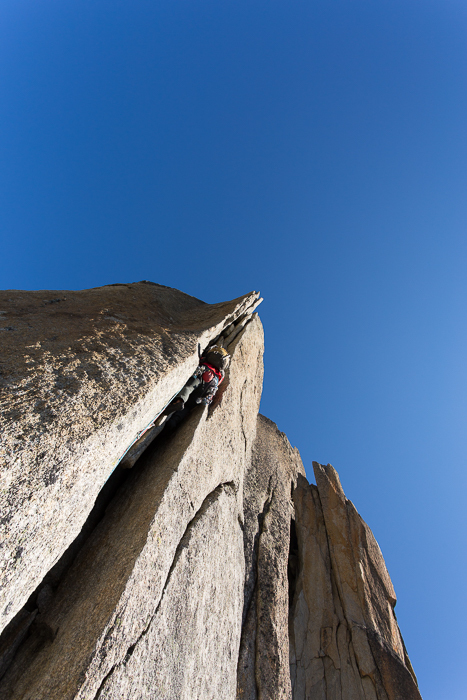 Sam getting on a full body pump on this awesome chimney pitch. 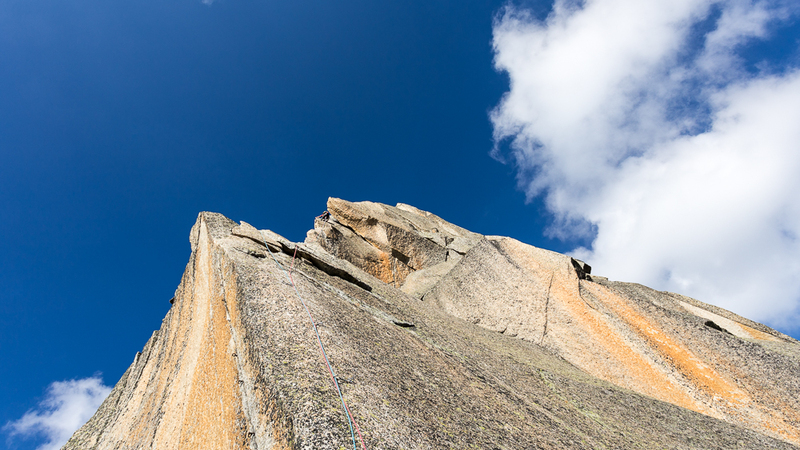 Sam makes a belay after what he described as one of the most awkward pitches of climbing he’s ever done – an easy ridge followed by some horrible 6a-ish down-climbing then a delicate slab traverse that leads to a flared and difficult to protect crack. It turns out most people rappel or use a pendulum to avoid the down-climbing, but Sam’s too hard for that sort of fannying about. On the other hand, I’m not and gladly took the opportunity to be lowered by Sam. Yet more amazing granite! 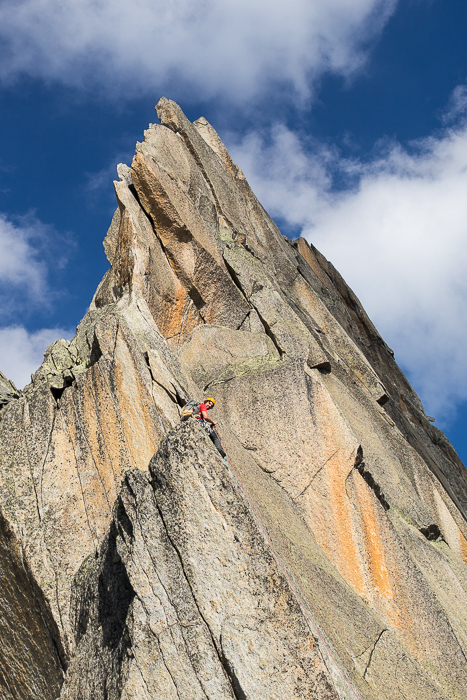 Sam gets ever closer to the summit on this incredible slab and layback pitch. After 12 hours on the go, we reach the summit. Exhausted but psyched to have climbed such an amazing route!